Your bathroom is a hive of activity, with people coming and going all day long, so it can quickly become cluttered and over-crowed with lotions, potions, and other bathroom necessities if everything doesn’t have it’s own place. When it comes to designing your bathroom, there are a whole host of effective storage solutions will allow you to optimise floor space and, most importantly, get organised! After all, creating a space that you will actually enjoy spending time in is pretty important, especially as the majority of us retreat to the bathroom after a long hard day at work. Shelving works really well in bathrooms as it allows you to optimise floor space whilst providing a practical and convenient space to store bathroom necessities such as towels, cosmetics and toiletries. One of this year’s key trends is to incorporate baskets into your shelving units – this will instantly add a functional yet ultra-stylish dimension to the space. Stacking wicker baskets in your bathroom also makes an attractive focal point – simply stack them underneath a pedestal sink or in an unused corner. This budget-friendly storage solution will not only enhance the look and feel of your bathroom space, it’s also a super practical and decorative storage solution too. And the advantage of this trend is that you can experiment with different shapes, sizes, and colours, positioning them as you like on your wall. They’re super easy to find too! From heated towel racks to tropical style towel racks, this functional storage solution is great for keeping your bathroom looking clean and tidy. Let’s face it, towels piled high in the middle of the floor is never a good look! Aside from the conventional towel rail, this year it is all about integrating unexpected storage into your bathroom space. For example, leaning a ladder against the wall to hang your towels is one of the hottest new bathroom trends – think bamboo, metal and wooden ladders! Wall cabinets allow you to optimise every last inch of space in your bathroom , organising! Available in a wide range of sizes, style and finishes, wall cabinets come complete with a variety of compartments which you can use as you please. But they are not only a practical storage solution, wall cabinets also lend themselves perfectly to the display of a whole host of decorative items such as ornaments, clocks and vases (bearing in mind, floral accessories is one of nest season’s key trends). Many also incorporate handy mirrors too! 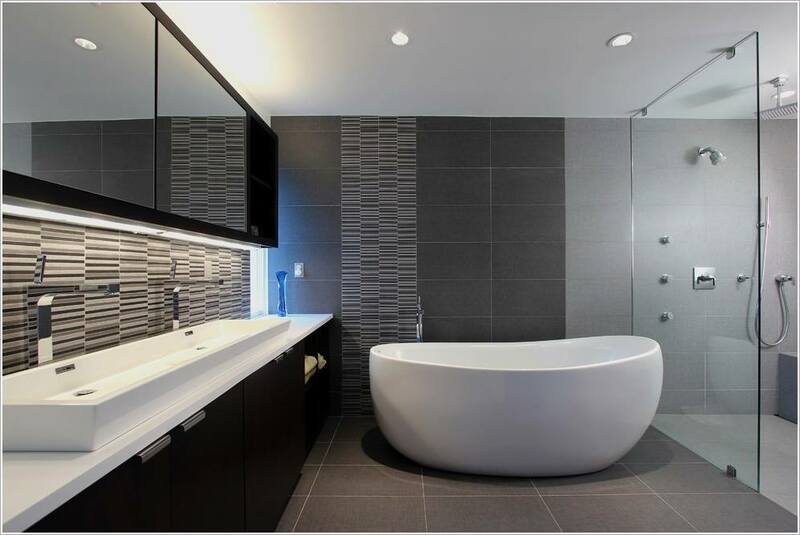 Here at Kenneth Installations in Glasgow, we are experts in our field, providing bespoke bathroom designs that are stylish, durable and accommodating. For more information about any of our services, please do not hesitate to get in touch, our helpful team are always on hand to answer any questions that you may have.